The Tulsa Trail School serves 280 second and third grade students in the Borough of Hopatcong, New Jersey. Principal Dr. Joanne Mullane sought a way to effectively communicate with all of the school's constituencies. She turned to StrandVision for its affordable digital signage services. 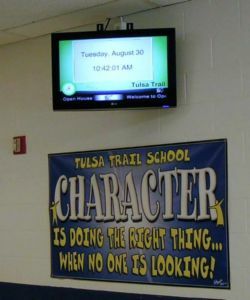 Now students and visitors are greeted by a digital signage display as they enter the building. Dr. Joanne Mullane was appointed Principal of the Tulsa Trail School in the spring of 2011. Even before officially starting, she began planning on several fronts. One of the areas was communications. The technology and facilities staffs handled the equipment installation in the entrance lobby, as well as the Internet connection to StrandVision's server cloud. Her objective was to reach parents and any community member who enters the building. At the same time, she wanted to reach students to reinforce the "Building Good Readers and Leaders" mission and communicate the "Seven Habits of Happy Kids" program. She explained, "I initially thought about creating some kind of tool, like a slideshow. I soon realized that digital signage would be a better way to go." She was aware of digital signage and had some ideas on how she could use it. The signage is fulfilling the school's communication needs. It lists events, such as faculty or breakfast book club meetings, report card schedules and other deadlines, as well as public events. Of course, students and student activities are prominently featured. "The students know when their picture or name is on the TV. They love to see themselves," said Dr. Mullane. She also checked on the Internet to see how the technology was being used in other schools, which is how she found StrandVision. She was attracted by the fact that StrandVision hosts the digital signage content, which simplifies the installation and administration. Dr. Mullane was also attracted by the price – free. StrandVision offers a free digital signage software service that enables subscribers to show a number of text and graphic pages on their digital signage screen. With a full year to work with it and able to convert it to a full subscription with more capabilities at any time, subscribers can use the free service for permanent installations, such as what Dr. Mullane envisioned. She signed up for StrandVision's free digital signage trial and soon created her own digital signage content using StrandVision's administrative tools. The next challenge was to find the required digital signage player display equipment. "We had the computer but not the monitor," she explained. "But we found some grant money that we were able to target for the digital signage monitor." "We also announce the day schedule and feature the Leaders and Happy Kids programs with visual support." Dr. Mullane no longer relies on old fashioned bulletin board notices; it is all done through digital signage. She updates the signage herself in the evening for the next day. "It doesn't take long to learn. I had a lot of support from StrandVision." And, she continues to have ideas on how to expand the StrandVision Digital Signage. An additional display monitor in the office would be convenient for visitors waiting for students or teacher meetings. She also would like to lower the position of a monitor so the children can more easily see the display. Adding video and audio to the signage will enable the signage to more prominently feature student projects and performances. "I am absolutely happy with the digital signage," concluded Dr. Mullane. "It's a great communication tool, children are happy about it and it has helped expand the leadership program."